Ihr freundlicher Reiseleiter und Fahrer holt Sie von Ihrem Hotel in Punta Cana für diesen unglaublichen Tagesausflug in die Fun Fun Cave ab. Ihr Erlebnis beginnt mit einem leichten Snack und einer 30-minütigen geführten Reittour durch die epischen Landschaften des Nationalparks Los Haitises. Sie haben auch die Möglichkeit, zu Fuß zu erkunden, während Sie auf einem 40-minütigen Spaziergang in die Tiefen des Waldes bis zur Mündung der Fun Fun Cave gehen. Bei Ihrer Ankunft wird Ihr professioneller Guide Ihnen helfen, 20 Meter in die Tiefe der Höhle abzuwehren, wo Sie die verborgenen Kammern und dunklen Tunnel mit westindischer Felskunst und fließenden Flüssen erkunden. Schlendern Sie durch die atemberaubenden Stalaktiten und Stalagmiten sowie unglaubliche Lavasäulen und Felsformationen, während Ihr Guide die dramatischen Merkmale der Höhle aufzeigt und Geschichte und Geschichten über dieses einzigartige Ziel erzählt. Sobald Sie die Höhle verlassen haben, können Sie ein schnelles Getränk genießen, bevor Sie zu einem traditionellen dominikanischen Mittagessen zu Ihrem Ausgangspunkt zurückkehren. Kühlen Sie sich mit einem Bad im nahe gelegenen Fluss ab (vergessen Sie nicht, Ihren Anzug zu tragen!) Und entspannen Sie sich anschließend für die bequeme Rückfahrt zu Ihrem Hotel in Punta Cana. Das war ein wirkliches Abenteuer! Es hat sehr viel Spass gemacht! Dazu kommt ein sehr witziges und erfahrenes Team vor Ort! Meine Frau und ich würden diese Tour gerne wiederholen! Die reine Tour war absolut Klasse, nur die An- und Abreise, von insgesamt 7 Stunden, war doch etwas zu lang. Im Bus war genug Platz, da an diesem Tag, nur drei Personen teilnahmen. Das Highlight war die Tour durch die Höhle, wir sind ca. 2 Kilometer weit gegangen. Ich wäre gerne weiter gegangen, da es in der Höhle mit 23 Grad auch angenehm warm war, leider ist der Einstieg bis zum Ausgang nicht weiter. I’m so glad that I picked this tour during my stay at Punta Cana. It’s great! My 11 year old son LOVED the horse riding and cave adventure. If you like hiking and adventure, you will definitely enjoy this tour. Our tour guide, Carlos, and his team are absolutely the best. I enjoyed every part of the tour, horse riding from the ranch to the foot of the hill, hiking to the entrance of the cave, rappelling down and exploring the cave. We were all soaking wet when we came out of the cave because we had to go under water at one point to get to the other side. But it was so fun! Even to a person like me who does not swim. We saw bats and shrimps in the cave. Spotted coca and coffee plants, passion fruits, plants used in mamajuana and a few termite mounds along the way to the cave. We do need to get up early on that day and the ride from hotel to the ranch takes 2-3 hours. But we got to see the countryside beyond the resort, so it’s also a plus to me. Remember to bring socks. You will need to change to their rain boots and it’s much more comfortable to wear with socks on. Carlos and his team are fabulous! They made sure everyone is safe and having as much fun as possible! I highly recommend this tour! Be sure to show up at least 15 minutes early if you booked transportation. The bus arrived 12 minutes early. The bus ride was 3 hours from the resort areas. No bathrooms on the bus, they stop after 2 hours. I wish we would have known before as we all would have made one last trip before getting on the bus. Bring napkins or toilet paper, none in the bathrooms where the bus stopped. 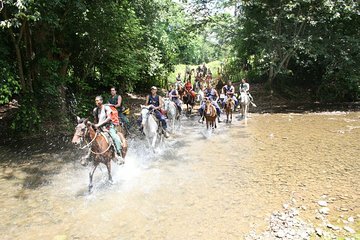 The horseback riding was great. The guides spoke excellent English. If you are an experienced rider, they will let you gallop, trot, etc. The hiking was 40 minutes and quite tricky to maneuver around rocky areas, but added to the experience. Repelling was a bit scary for first timers. The guides are wonderful and will take the time to ensure you will be ok. My daughter was to the point of hyperventilating seeing how far down (45 ft/18 meters) the repelling was. She did fine. The spelunking was AWESOME. 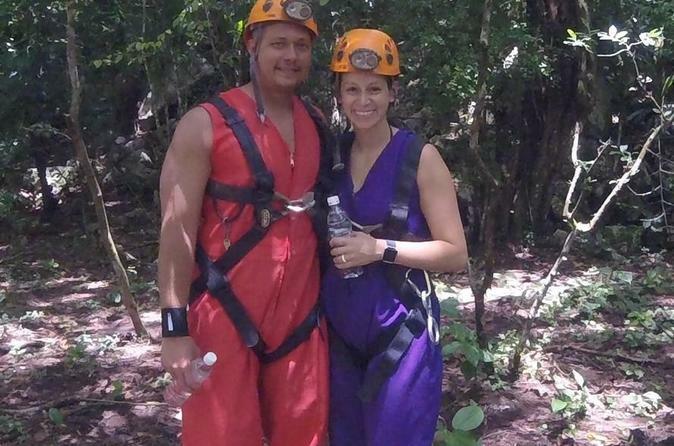 If you are going to Punta Cana this is the best tour. Skip Scape Park and do this instead, you will not be sorry. Our first day in the Dominican Republic so we were nervous but the guides took care of everything and we were able to relax and have a lot of fun. An authentic ranch, a horseback ride and hike under huge amazing trees followed by a fantastic cave with impressive formations and a stream flowing through it. A long bus ride but totally worth the time to see the real country away from the resorts. On the drive up we stopped at a local shop where we had a selection of local food and chose their white yam for only $1US Then a stop on the way back to buy mangos from a vendor along the road - $2US for about 30 of them! I'll put this at the beginning in case you do not read the whole review. BRING SOCKS high socks recommended AND BUG SPRAY. My husband and I enjoyed our trip to the Fun Fun Cave, pronounced Foon Foon because that is the noise the bats make when they flap their wings. It was actually just the two of us on the excursion, so our experience is probably a bit different then if you went with a large group. Our hotel Palladium TRS Turquesa was not listed as a pick up location. We had to call and confirm and they did get lost trying to find us that morning. We had to wait about 45 minutes before they showed up. The bus ride is long. It took three hours to get there. The two people that picked us up swapped out with about five people half way through, which included 2 of our tour guides for the trip. On the way back they swap out again and the same people that picked us up brought us back to the hotel. Everyone was really friendly! Once we arrived we ate breakfast at the ranch, which included ham and cheese sandwiches and a fresh homemade cherry drink. We then changed to get ready for the cave. This included a jumpsuit, boots and rappelling gear. I mentioned bringing socks earlier because you have to wear the boots they provide. My husband went without socks and said he was fine. I borrowed some because I was worried about blisters. They were used socks, so again bring some of your own and even an extra pair if you want some dry ones for later. We got on our horses next and went on about a 30 minute horse back ride. Then we got off and had to hike the rest of the way to the cave entrance. This hike took about 45 minutes and was very strenuous. It was fun but you really should be in good physical shape. You go up and down hills and climb over rocks and it is very hot. Our tour guide, Carlos, gave us a plant to rub on us that repels mosquitos because we forgot bug spray. It really must have worked because we only had about 2 bug bites. But try not to forget your bug spray! Rappelling was easy and fun. They set you all up and one of the guides waits at the bottom for you. You can go down as slowly as you would like. We got into the cave and they began telling us the history of it and different cave facts. Walking through it was great. And depending on how high the river is, you might be able to go underwater for a brief moment like we did. Gary, our other guide waited at an opening in the water and one at a time we took his hand and dipped under the water to the other side. It was a very refreshing experience! We also got to see bats while in the cave. They didn't bother us or really pay any attention to us. When we made it to the end of the cave, we walked up a few steps and rested for a minute before we got back on our horses and headed back to the ranch other people brought our horses to that location. The horse ride back was beautiful. We went through the Dominican country side. It was so lush, full of trees and hills. There were a lot of goats around as well. When we got back we changed and had lunch. It was delicious. I am a vegetarian and they told me if I had let them know beforehand they would have accommodated me. But the beans and rice and their version of a potato salad was delicious enough! They also had chicken. We filled up and headed back to our hotel. Overall, it was a wonderful experience that we will never forget! Definitely worth going! And remember to bring tip money. Once we arrived at the Ranch where the horses and the cave are located it was a great fun adventure. Once on site the guides get your suited up in a light weight coverall and rubber boots because you are going to get wet and dirty. Next you have to put on a harness so that the guides can hook you up for repelling down 18 meters into the cave. Then its about a 20 minute horse ride and a 1/2 hour hike to the entrance to the cave. The walk through the cave is about 2 kilometers. About 1/3 of it is in knee to waist deep water with one very short section about 2 feet under water. the guides are there to hang onto you. Watch your step on the way out. Very slippery on the way out. The bus ride to the ranch and back is a killer about 3 1/2 hours each way. They could also skip breakfast ham and cheese on a dry roll. The lunch was great though. Chicken, pork, rice and beans. Typical Dominican. We were a family group from 11 to the old guy me at 74. We all had a great time and will talk about for years. This was hands down one of the most amazing excursions I have ever been on. Our tour guides were kind , knowledgeable , and funny. If you are looking to do something new and have a real adventure then you need to book this excursion. We rode horses, took in the beautiful scenery around the ranch, had a good lunch as well as breakfast, and experienced repelling into the belly of a cave. I highly recommend this tour especially if you are a traveller who wants to escape the resort and really have a memorable time ! Would have given a five but after we came back from the even for lunch. the tour guide asked me why Americans want give dogs chicken bones and as an Animal Rescue and Foster I told him and he said that want happen in the DR and started giving this puppy whole chicken bones, Due out of respect to my worries of this you DONT do it in front of your guest whom is against it! This tour was truly a one of a kind experience! Carlos, Hendrix, and Carla were great hosts. The drive from Punta Cana was long but very interesting. The cave was amazing and Carlos and Hendrix made everyone feel very safe. The food, especially the lunch afterwards, was delicious! So highly recommended. DO NOT MISS THIS EXPERIENCE.